Imperial Designs is the last volume of my trilogy. The book follows Breeding Ground, a study of Afghanistan from the 1978 Communist coup to 2011; and Overcoming the Bush Legacy in Iraq and Afghanistan that evaluates George W. Bush’s presidency in terms of the “war on terror,” focusing on the invasions of Afghanistan and Iraq and their aftermath. I had suggested in the two previous books that among the factors contributing to the events of September 11, 2001, was a sense of humiliation felt in the Muslim world, especially in the Middle East. It made me think further about war and humiliation in international politics, and how war, humiliation and manipulation have historically affected the behavior of the humiliated and the humiliator. My focus in Imperial Designs was the Greater Middle East. For oil, geopolitics and imperial rivalries between Britain, Russia and the United States had been among my interests. The history of Arabs and Persians is rich and interesting. They have both fought numerous wars over the centuries. The history of external actors’ meddling in the region, by the Ottomans, then the British, the Russians and the Americans is intriguing. The consequences have been profound and far-reaching. 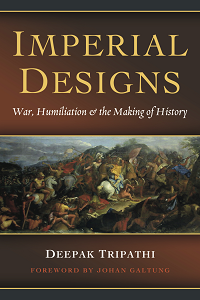 In Imperial Designs, I examine the Ottoman Empire’s collapse around the First World War in the early twentieth century; the discovery of oil in the region and the division of lands between Britain and France; the creation of the state of Israel after the Second World War and its meaning for Palestinians and Arabs; and further conflicts. In Iran, the early democracy movement; the 1953 overthrow of the democratically-elected government of Prime Minister Mohammad Mosaddeq in an Anglo-American intelligence plot; and subsequent events over a quarter century until the overthrow of the Pahlavi dynasty in the 1979 revolution. Examination of events such as these is relevant in any study of the role of humiliation and the shaping of the contemporary Middle East. I demonstrate that the continuing upheaval in the region has its origins in the events around the First World War a century ago, when Ottoman rule was replaced by British and French colonial rule using the instrument of “Mandate.” I also discuss how conflict between tribes and wars with external invaders have determined the thinking and behavior of local peoples through history. Vast sandy deserts, a free spirit and a warrior instinct are fundamental elements of Middle Eastern cultures. Repeatedly, wars put those instincts on display and reinforced them. Through history, where desert communities were sparsely located, interaction was less between them, but more within members of each community or tribe. The emphasis was on cohesion within each tribe. Personal possessions within the general populous were fewer, and lifestyle was frugal for most members. Wealth tended to accumulate with chiefs. Honor, its dispossession causing humiliation, and promises betrayed became strong drivers of human behavior. Defending the honor of a person, a clan, tribe or nation–and regaining it after humiliation–became of utmost importance. Past injustices and unsettled disputes persisted, and more added to the long list as time went by. Power and humiliation are the cause and effect of human behavior. In Imperial Designs, I also discuss interventions by Russia, Britain, and the United States in Iran and the consequent radicalization of the Iranian population. My observation is that, throughout the region, the greater the scale of mobilization by opposing sides locked in conflict, the deeper, more long-term reaction it generates. The greater the defeat, the more intense and long-lasting the determination in the vanquished to extract the price for humiliation. It is this pattern of events through history that explains the making of the Middle East.